For easy and quick control of your PTZ camera, be sure to purchase a PTZ joystick controller. You can choose from easy to connect cabling to use with your PTZ camera. This Night Vision PTZ Camera is the latest addition to our line up of HD over coax pan tilt zoom cameras. Its 500ft infrared night vision in complete darkness and 25X optical zoom are unmatched by any other product in the market at its price point. This is truly a long range infrared PTZ camera for a fraction of the cost. It produces amazing quality HD video at 1080p resolution and is compatible with any of our HD Security DVRs to take advantage of the features provided by the HDCVI signal. 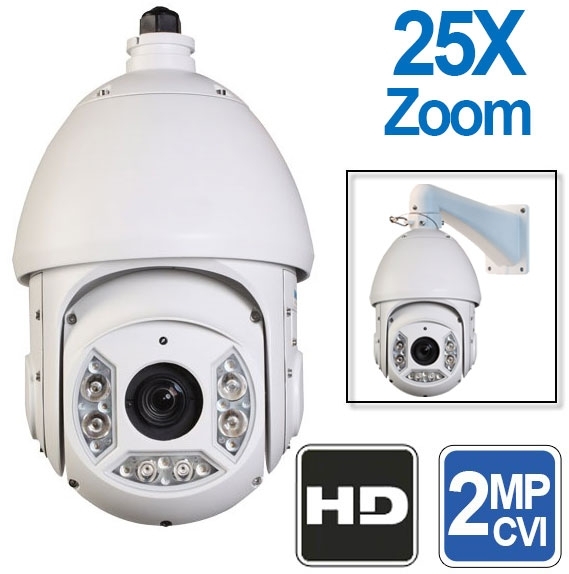 It can also be used with an analog DVR by setting the camera to Standard Definition and using its RS485 2 lead wire with a PTZ controller or analog DVR. It has 360° continuous rotation ability and auto-flip feature when it reaches the top or bottom of the field of view to look on the other side. The camera has Starlight technology and True (WDR) to provide impressive video in color in very low light, or it can switch to black and white mode in complete darkness when the infrared LEDs turn on. Like any professional PTZ camera, it also allows the user to set up to 300 presets using our HDCVI DVR or with an analog controller over RS485, and up to 5 patterns or 8 tour sets. There is also a 3D targeting feature in our HDCVI DVRs and PTZ cameras that makes it easy to zoom in on an area by simply drawing a rectangle with your mouse at the DVR and the camera will zoom into the location you select. You can even use this 3D targeting method using our friendly PC software when viewing your camera over the internet through one of our DVRs. Our smartphone and tablet apps also let you control this outdoor HDCVI PTZ from anywhere in the world when connected to a DVR. Wiring this camera is much easier compared to traditional analog PTZ cameras. HDCVI technology allows you to run your cameras up to 1600ft without losing video quality and simplifies wiring of PTZ cameras. You no longer have to run multiple wires to connect a PTZ camera to the DVR, but the camera does have RS485 connections if you are still using an analog digital video recorder. Simply power the camera using the included power supply, and run one good coax cable (RG59U from a spool) from the camera to the DVR. That one coax cable can carry the video and RS485 data signals over it to an HDCVI DVR. If you are setting the camera for control from a security station, you can also use our 3 Axis PTZ Controller and connect it to the RS485 outputs from the camera. This camera is a perfect addition to HD security camera systems for projects requiring long distance surveillance in complete darkness. 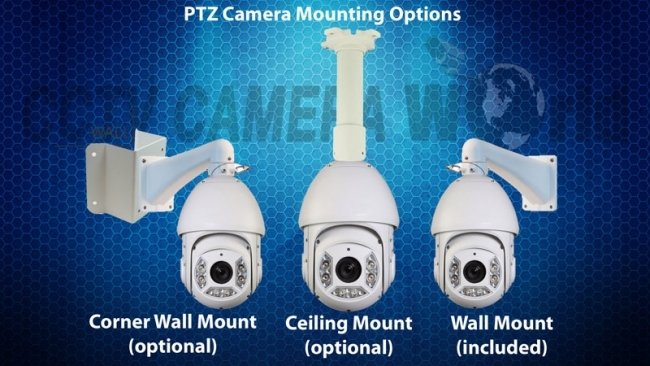 It is a full-size outdoor PTZ camera and comes with a wall mount as the default bracket. You can purchase optional brackets using the selection menu above the add to cart button. The camera is rugged and weatherproof IP66 rated to withstand rain, snow, and dirt. It is made with quality components and built to last. Why buy this 25X over a 30X PTZ Zoom Camera? When shopping for the optical zoom capability of a PTZ camera you should look at the actual specification of the zoom lens and not the zoom power stated as a number with an X. This camera has a 4.8mm to 120mm Lens. If you divide 120mm by 4.8mm you get a zoom power of 25X from the starting position of the lens. Compare that to many 30X PTZ cameras on the market which have a 3.6mm to 110mm Lens. 110mm is less than 120mm, which means that this 25X PTZ Camera can see farther. This is where weeding through marketing hype is very important to make an informed purchasing decision. Close Focus Distance 3.94" - 39.4"
*Distance is calculated based on sensor specifications and lab test results set at full optical zoom according to EN 62676-4 guidelines for security cameras which defines the criteria for recognition and identification. I would like to know if this PTZ camera can be mounted with the camera on top instead of the bottom? Yes you can use it upside down. You will need one of our Security DVRs as they are able to sense the 1080P HDCVI video output and allow the image to be flipped or rotated. What all would I need to run your long range infered ptz camera, 500 ft night vision. Can you put a package together with every thing needed to set up. Is there a distributor in A lberta Canada. We do not have a presence in Canada. We do ship to Canada from the USA. Do I have to use a DVR with this camera? I would like to view the video feed on a laptop. Can I output from the DVR to the laptop or directly from the camera? This is a HD over coax camera, and to decode the signal you need a HDCVI DVR as mentioned in the first paragraph of the product description. You can certainly login and view the cameras using a computer with any of our DVR recorders as shown in the videos on this page. Free client software is available for all our systems. You need to email tech support after your purchase for a download link. If you look under the product questions tab on the product description here is what you need to use with the camera. RG59 Coax Siamese Cable Roll - you can only use a coax cable from a roll for running a PTZ video signal alongside 24V AC. This one cable will run the video, PTZ, and power up to 100ft to the camera. If you would like to use a PTZ controller, you would have to use the PT500 ptz controller. Kindly watch the videos underneath the product thumbnail on the following page to learn how it works.